Announcing the all-new StickyCup windshield mount! The new StickyCup windshield mount includes a semi-sticky gel ring on the cup surface. The gel ring helps the StickyCup provide dramatically improved performance by filling in unseen but otherwise potentially destructive imperfections on the windshield mounting surface. With the gaps eliminated, StickyCup provides significantly greater surface adhesion and attachment force to the windshield. 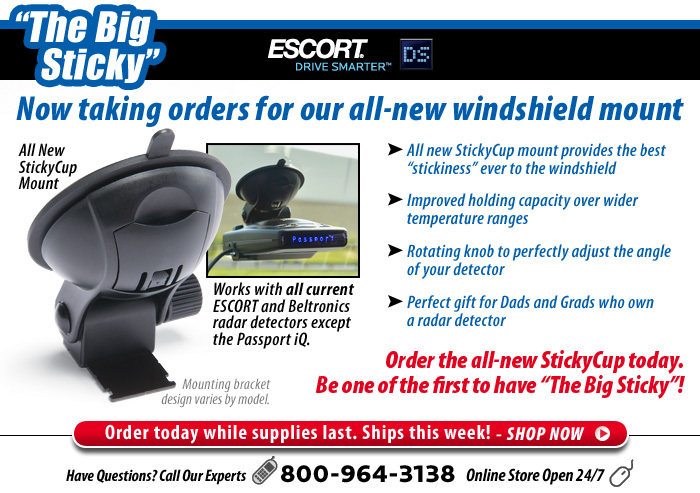 StickyCup is easy to use and fits all grades and slopes of automotive windshield glass. The new mount includes a rotating knob that adjusts the angle of the StickyCup bracket to perfectly match the pitch of the driver’s windshield. Once set, the mount permanently mirrors with the windshield slope and is always ready to use. “I think the windshield will detach from the car before the StickyCup comes off” – Paul J. This new StickyCup looks awesome ! It isn't compatible with Passport iQ, but is there another "work in progress" StickyCup pending for the Passport iQ ? I'm finally replacing my IQ, and just opened the new Passport. looks like building another custom mount will be in the works, While programing the new detector it fell off the windshield. It seems that it does not like bumps in the center of my windshield, and I Refuse to mount it lower in my line of sight or within eye sight outside of the vehicle. anything less than perfectly flat smooth glass is an issue. I have the Passport 8500 X50, is the regular StickyCup mount compatible with this detector? We offer a StickyCup which works with the Passport 8500 X50. Here is a link to it. I looking for 9500ix intl, is the same or another one must purchease? Yes this StickyCup will work with the 9500iX International.